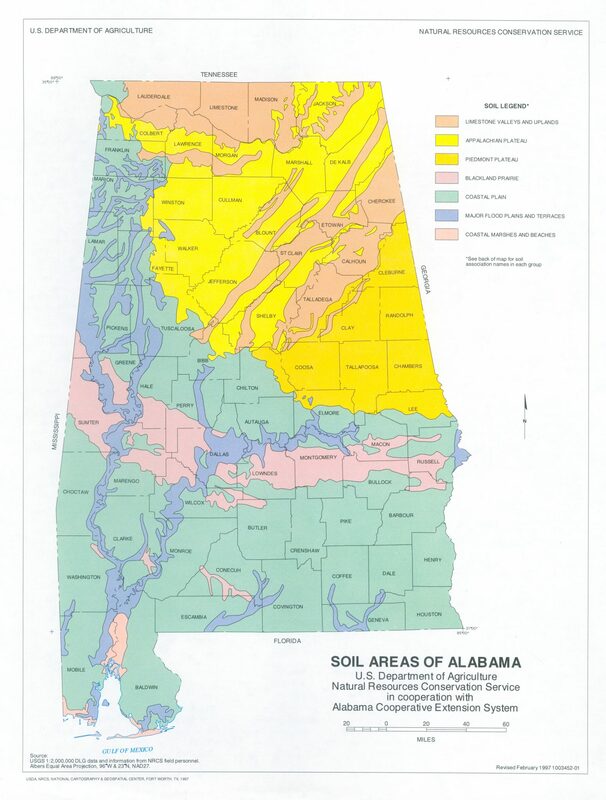 Alabama has several major soil areas. Most of the soils within each area were formed from materials with similar characteristics. Detailed soil surveys, available for most counties, show that each area has several major soil series. A soil series is a part of the landscape with similarities among its properties such as color, texture, arrangement of soil horizons, and depth to bedrock. Soils in this area were formed mainly in residuum weathered from limestones. Soils of the Tennessee and Coosa river valleys were weathered from pure limestones and are mainly red clayey soils with silt loam surface textures. Decatur and Dewey soils are extensive throughout the valleys. Topography is generally level to undulating. Elevation is about 600 feet. Most of the land is open and cropped to cotton or soybeans. Most of the soils of the uplands are derived from cherty limestones. Bodine and Fullerton soils are extensive in many of these landscapes. They typically have gravelly loam and gravelly clay subsoils and gravelly silt loam surface layers. Elevation is about 700 feet, and topography ranges from level to very steep. 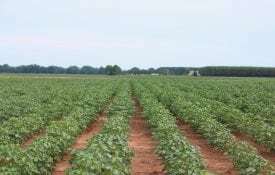 Cotton and soybeans are major row crops. Much of the area is used for pasture or forest. The Appalachian Plateau comprises Cumberland, Sand, Lookout, Cuntei Brindlee, Chandler and other smaller mountains. Most of the soils are derived from sandstone or shale. The more level areas are dominated by Nauvoo, Hartsells and Wynnville soils which were formed in residuum from sandstone. They have loamy subsoils and fine sandy loam surface layers. Most slopes are less than 10 percent. Elevation is about 1,300 feet. Corn, soybeans, potatoes and tomatoes are major crops. Poultry is very important in this area. The more rugged portions of the Appalachian Plateau are dominated by soils such as Montevallo and Townley, which were formed in residuum from shale. These soils have either a very channery loam, or a clayey subsoil and silt loam surface layers. Most areas are too steeply sloping for agriculture. Elevations range from 300 to 700 feet. Most of the soils in this area are derived from granite, hornblende, and mica schists. Madison, Pacolet and Cecil soils, which have red clayey subsoils and sandy loam or clay loam surface layers, are very extensive. Elevations in most areas range from 700 to 1,000 feet, although in the Talladega Hills, elevations range from 900 to 2,407 feet (highest point in Alabama). Topography is rolling to steep. Most rolling areas were once cultivated but are now in pasture or forest. Most of the soils in this area derived from marine and fluvial sediments eroded from the Appalachian and Piedmont plateaus. The area consists of Upper and Lower Coastal Plains. 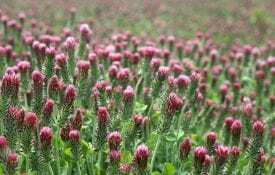 Smithdale, Luverne and Savannah soils are extensive in the tipper Coastal Plains. They have either loamy or clayey subsoils and sandy loam or loam surface layers. Savannah soils have a fragipan. Topography is level to very steep. Narrow ridgetops and broad terraces are cultivated, but most of the area is in forest. Elevations range from 200 to 1,000 feet. Dothan and Orangeburg soils are very extensive in the eastern part of the Lower Coastal Plains. 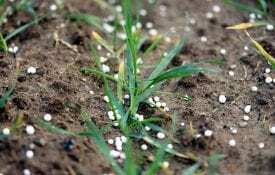 They have loamy subsoils and sandy loam or loamy sand surface layers. Snuthdale and Ruston soils are very extensive in the western part. These soils have loamy subsoils and sandy loam surface layers. Most slopes are less than 10 percent. Major crops are corn, peanuts, soybeans and horticultural crops. Timber products and hogs are very important. Elevations range from sea level to 500 feet. This area of central and western Alabama is known as the “Black Belt” because of the dark surface colors of many of the soils. These soils were derived from alkaline, Selma chalk or acid marine clays. Acid and alkaline soils are intermingled throughout the area. Sumter soils, which are typical of the alkaline soils, are clayey throughout and have a dark-colored surface layer and a yellowish colored subsoil. Oktibbeha soils are acid and clayey throughout. They have red subsoil layers overlying chalk. The clayey Wilcox, Mayhew, and Valden soils are the dominant soils of the rolling pine woodlands along the southern edge of the “Prairie.” They are acid and are somewhat poorly drained or poorly drained. They are locally known as “flatwoods” or “post oak clays.” These clayey soils contain a high percentage of smectitic clays and they shrink and crack when dry and swell when wet. The area is level to undulating. Elevation is about 200 feet. Soybeans is the main crop. Most of these soils are used for timber production and pasture. The soils are not extensive but important where they are found along streams and rivers. They are derived from alluvium deposited by the streams. The Cahaba, Annemaine, and Urbo series represent major soils of this area. A typical area consists of cultivated crops on the nearly level terraces and bottomland hardwood forests on the floodplain of streams. The soils are not extensive. They are on nearly level and level bottomlands, and tidal fiats and beaches along the Mobile River, Mobile Bay, and the Gulf of Mexico. Most of the soils are deep and very poorly drained Dorovan and Lafitte series have very dark grayish brown, muck surfaces over a thick blackish muck which is over brownish sand. Axis soils have a very dark grayish brown mucky sandy loam surface over a very dark gray sandy loam subsoil. Levy soils have a gray silty clay loam surface over gray clay. Fripp and Duckston soils have a grayish sand surface over white, grayish or pale brown layers of sand. Elevation is from sea level to a few feet above sea level. Download a PDF of Soils of Alabama, ANR-0340.